Aaaaaargh! Or as Browning says at the beginning of ‘Soliloquy of the Spanish Cloister’, a poem I have been busy ‘echoing’ with the help of my i-phone, ‘Gr-r-r—there go, my heart’s abhorrence!’ Thing is, my heart abhors the fact that I haven’t posted in over 2 months, my head abhors it too. I have been putting it off and putting it off, which is nonsensical because I have meanwhile managed to find plenty of time for complete social media paralysis, elsewhere on Facebook and Twitter. But by last Saturday I felt truly cleansed of virtual distractions, after a week without phone signal or internet (OK, the odd sneaky knock on the door of the Arvon office at Totleigh Barton with a ‘pretty please may I just check the internet, it’s for poem research purposes?’). Stressful at first, but actually, once you step into a beautiful old cottage like that – open fire, long heavy wooden dining table, private poetry library – not to mention clotted cream with everything! – you remember how special those Arvon houses are as a complete retreat from all life’s distractions. Having grown up in a small 18th century house too, I know how calming it makes me feel, the old wood, far-from-square rooms, sloping planked floors, odd-shaped doors, walls that have seen generations. 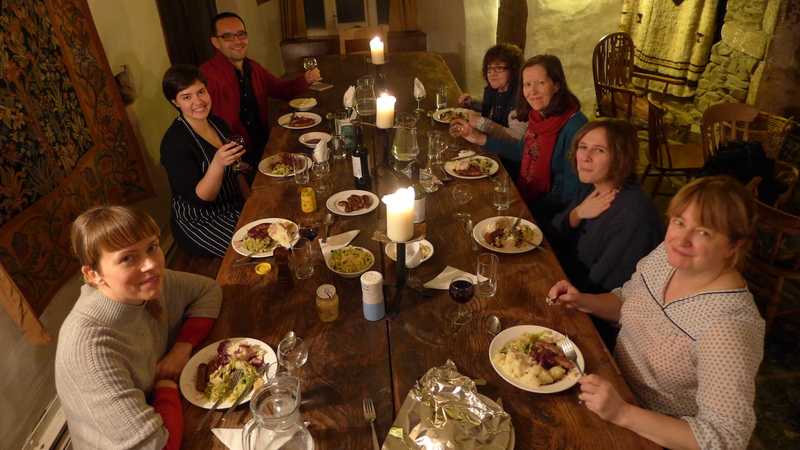 This was the final week of the Jerwood/Arvon mentoring scheme. We first met up in March last year with the 3 tutors. This year it was just the 8 of us (9 minus father-soon-to-be Niall), left to our own vices/devices. None of us actually thought we would make it given the incredible floods on the Somerset levels and across the Thames Valley, the rail track washed away in the south west at Dawlish. Yet, I ended up getting a direct train – could get on any one, booking confirmation was fine, didn’t even have to print my ticket – and arriving 2 hours earlier than usual! Chance for a quick pub lunch with the brilliant playwright German Munoz, whose excellent plays ‘Straying in Seattle’ I’d seen the week before at the White Bear Theatre in Kennington. Fantastic to see work that we had acted out at Totleigh in its early stages brought to the stage a year later, and still evolving… And even Grace managed to get to Devon from outside Edinburgh, even if the taxi turned up just before midnight and the railways did their best to put her off travelling. She made it! 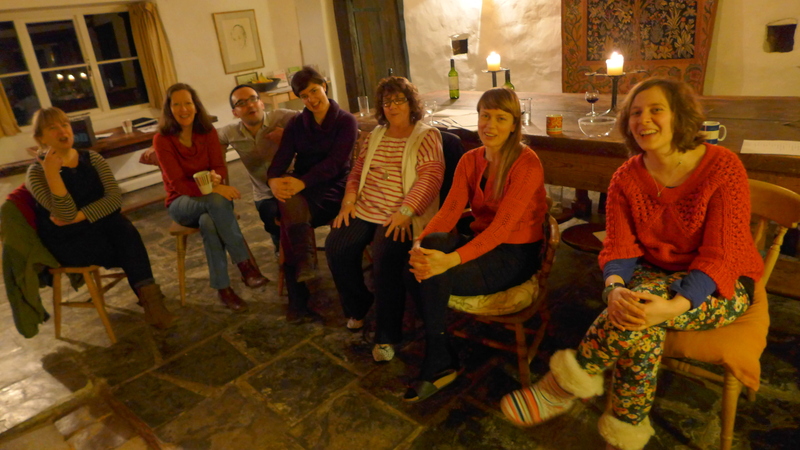 We had a cosy, intimate week, with far less drinking than usually goes on on an Arvon. 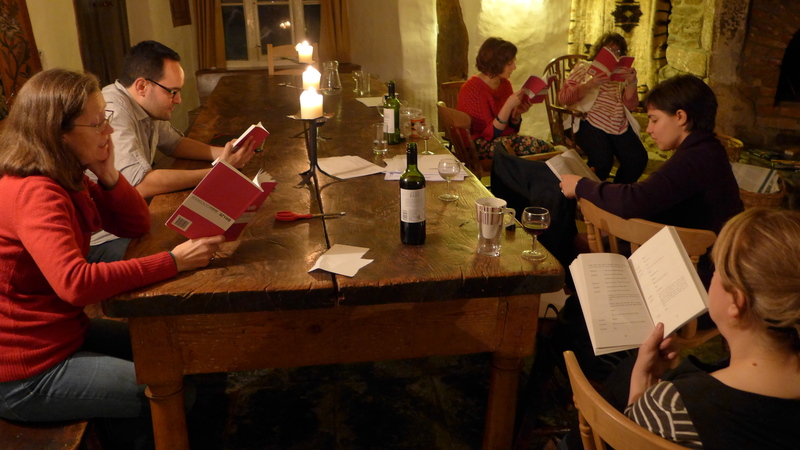 Regular meals together, then sitting around the fire we acted out the plays from the previous years’ anthologies – one of which, by Gemma Langford, was about a chaotic hairdressing salon – had us in absolute hysterics. Brilliant writing (Note to self: find out if the full play was ever staged). We even acted out the short play that four of us wrote last summer using Google Hangouts, subjecting the other poor 4 writers to our bizarre tale of a suffragette called Rose, an ex-con called Darren, Jean Rhys, Nancy Mitford and a bright orange caterpillar, all of whom ended up descending on the house and shed. Next night, we played a brilliant book game where you take a pile of modern novels, somebody reads the blurb on the back and everybody has to write what they think they can pass off as the first line of the book. All versions, plus the real one, go into a hat, and everybody has to vote. Some are hilarious, because they are so ridiculously close to what is mentioned on the back that there is nothing subtle whatsover. Anyway, I didn’t write much, expect a poem dedicated to the dead Danish giraffe, Marius, but revisited some old poems and had a really good time sitting with poet Samantha Jackson and critiquing each other’s work, picking up random books from the library. I read some Ted Hughes, Douglas Dunn, late Peter Redgrove and got stuck into my just-arrived copy of ‘Talking Vrouz’, the folllow-up to Valerie Rouzeau’s brilliant ‘Clear Spring in Winter’, translated beautifully and very playfully by Susan Wicks, both published by Arc. 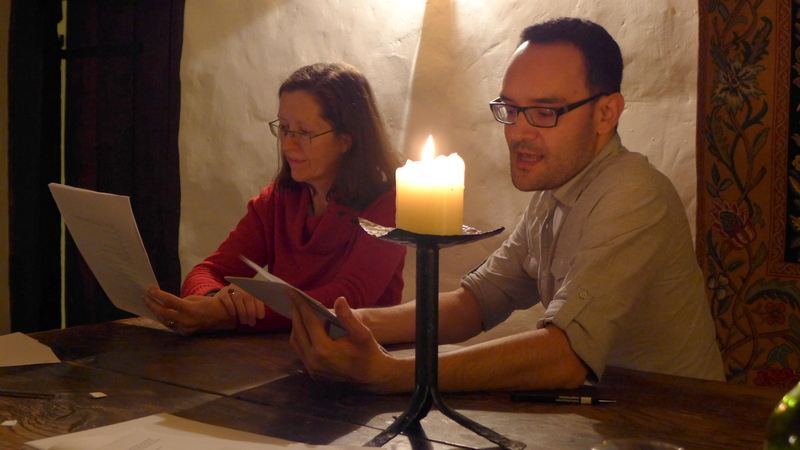 Then on the last night we each ‘tried out’ a little of what we had written this year and sat up until 3 am. We got to hear Stephanie Scott’s brilliant Californian accent of a Mars Rover with attitude being repeatedly insulted by Ground Control, and Sarah Hegarty’s fabulously frustrated wife wound up about her cat Pickles, who her psycho husband has put in a box as part of science experiment (German’s short plays). I got to hear some of the first chapter of Jessica’s novel, a freshly written scene from Yvonne’s play, new poems written that week by Sam, and a finished dialogue performed by Grace. I’ve really enjoyed experiencing the other genres, and not just poetry. And while we were there, the latest Rialto arrived with six of Niall’s poems and a self-reflection piece in issue 79, so he was there with us in poetic spirit. Next day the rollercoaster bus ride back to Exeter St. Davids – with an elaborate detour – and then took our chance on the trains. Nothing by Great Western was running into Paddington, but South West trains managed to get us into Waterloo in four and a half hours via Salisbury and Southampton, and with 6 of us on the train it wasn’t at all bad. Then the shock of the crowds and the hubbub, the coffee chains and tube. Now just the sort of post-natal Arvon depression, the yearning to get away from it all again. In the six weeks prior to that, erm…???? Well, I had a week or so of writing in a frenzy, experimenting with my iphone and its autocorrect, to give me some kind of constraint, and see how I might respond to Browning’s monologues, encouraged by my mentor on the scheme, Patience Agbabi – work very much in progress, I’ve finally got over my intimidation with these long, sometimes cryptic Victorian monologues! – and I had a run of good luck in competitions: first place in the South Bank Poetry competition (thank you Clare Pollard), second in the Cafe Writers Open Poetry comp (thanks to Derryn Rhys Jones) and a special mention in the Magma Editor’s comp. You wait for two months and then a mammoth post turns up! I’ve never been on an Arvon course … one day. Congrats on all the poetry success. Found ‘Round the Block’ and read it through, twice, straight off, which seemed somehow appropriate. Loved it.